Certified, Leather Seats, Bluetooth, Premium Sound Package, Power Tailgate, Rear View Camera! The 2015 Ford Explorer is Kelley Blue Book's winner for 2015 5-Year Cost to Own award. This 2015 Ford Explorer is for sale today in Calgary. According to kbb.com, in the world of midsize 3-row crossover SUVs, the 2015 Ford Explorer remains a tough act to follow. It's roomy, comfortable, versatile, and more fuel-efficient than ever before, The smooth ride feels much more like a car than an SUV and its quiet ride insulates you from the noise of the road. This SUV has 110797 kms and is a Certified Pre-Owned vehicle. It's white platinum metallic tri-coat in colour. It has an automatic transmission and is powered by a 3.5L V6 24V MPFI DOHC engine. 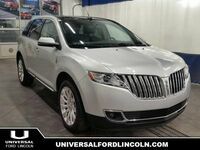 This vehicle has been upgraded with the following features: Leather Seats, Bluetooth, Premium Sound Package, Power Tailgate, Rear View Camera, Memory Seats. It has a certified used vehicle warranty for added peace of mind. Our Explorer's trim level is Limited. Revel in power, balance, and style with the Limited model. It lets you and your passengers travel in style with luxury features inside. It has power liftgate, fog lamps, leather-trimmed heated bucket seats, auto-dimming rearview mirror, a backup camera, memory settings for seats, mirrors, and pedals, and the SYNC infotainment system with Bluetooth, SiriusXM, and Sony premium audio.